As planned, I woke up early today to make breakfast for darlin' & I. So what's on the menu today? 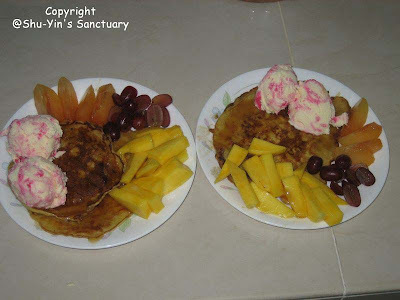 PANCAKES...with fruits and ice-cream. The ingredients needed are pretty simple. 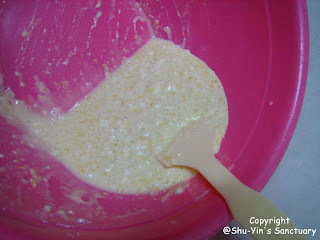 Flour, milk, sugar, baking powder, egg, butter and salt are needed to make the batter. 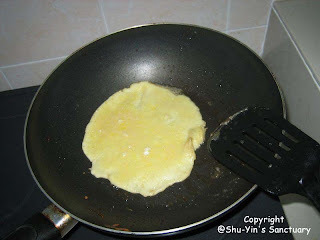 However, I think my batter ended up too watery, thus while frying, batter kept on spreading and making my pancakes wider. Hmm....too much egg & milk? or not enough flour I suppose. (I did not follow the recipe exactly as I didn't want such a big portion). Anyway, I think they still look presentable and the taste is superb! i see that you're serving really nice food these days. i will be dinner-less these couple of days. i think my dinner tonight would have to be instant noodle. wah.. bersemangat siut! 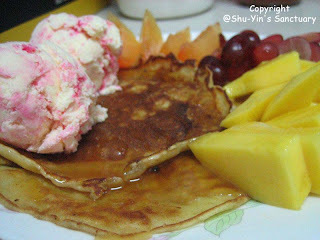 When I was pregnant, I was more bersemangat in eating than cooking.. and trust me, I ate LOADS of pancakes, ice-creams, steamboat buffet, ribs.. never once did I even lift a finger to want to cook.. HAHAHAHAH i salute u wey! emily...haha. it is ok. u are still so slim n pretty now even though u ate loads during pregnant! 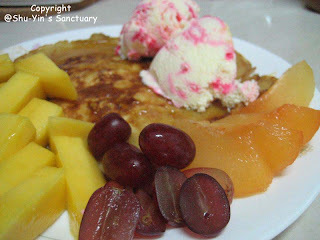 Eh... one day you make pancakes and we'll go over to your house and eat ah. Oh no....you really make me hungry...Just can't wait to try....Then at the same time, we can give you opinion how it taste..